It’s no wonder that Catalina Island — officially known as Santa Catalina Island — has a reputation as hot spot for the “beautiful people.” The tiny island, located off southern California, has plenty of protected coves, harbors and beaches, as well as warm water brimming with exotic sea life. You certainly don’t have to be a movie star to come to Catalina, however. Day trips and affordable lodging options make the island a great option on any budget, as does the plethora of protected land allowing for access for swimming, boating and snorkeling. For novice snorkelers, going on a guided tour is always a good first step. Not only is snorkeling equipment (like the mask) and equipment instruction included in the price, but the group leaders are likely to dive down to bring up some of the more elusive sea life to examine, as well as to bring along bait to help you safely witness a “feeding frenzy” from large schools. Casino Point Dive Park is located just off Avalon, Catalina’s largest town. 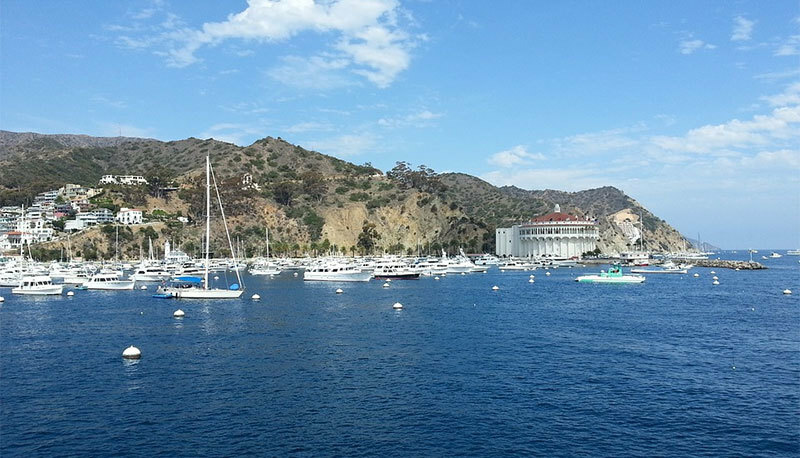 Avalon itself is on southeastern tip of the island, which is also the closest part of Catalina to the mainland. Marked by the island’s massive casino — a gathering place and entertainment complex designed to evoke a Mediterranean flavor — Casino Point is a mecca for underwater explorers. Also known as the Avalon Dive Park, this marine preserve caters to snorkelers and scuba enthusiasts, with easy-access stairs into the water, as well as booths and shops offering equipment rental and guided tour possibilities, complete with optional underwater camera rentals. This snorkeling location is a good spot for both family and couple trips, with the roped-off area keeping things safe, and the “underwater garden” boasting colorful sea life and even shipwrecks. Visibility is great and the surf is usually calm. Expect to see plant life such as giant kelp, along with aquatic creatures like schooling fish, sea urchins, sea cucumbers, spiny lobsters, horn sharks, tree fish and colorful Garibaldis. Depending on the season, you may even happen upon giant black sea bass, or even an octopus. An adjacent beach provides post-snorkeling fun, as do nearby eateries and shops and the Casino itself. Keep in mind that while Casino Point Park does offer the advantage of easy access for novice snorkelers, this State of California-protected sanctuary is a public one. Therefore, it’s not exclusive to snorkelers. Glass-bottom boat tours and divers with heavy tanks also use the marine park, so it’s important to keep your eyes open to avoid bumping into them. Like Casino Point Diving Park, Lover’s Cove is located off Avalon, in the southeastern portion of Catalina. Unlike Casino’s Point, Lover’s Cove — which is across Avalon Bay from Casino Point — does not have a sandy beach attached to it, and it is a little further from the center of Avalon. This may be a drawback for those hoping to add activities to snorkeling, but it also makes for a more secluded snorkeling experience. The crescent-shaped cove is a protected area, allowing for large swaths of giant kelp “forests,” along with sea life such as calico bass, orange Garibaldi fish, and lobster. While you can go on your own if you have snorkeling experience, the local tour companies go out of their way to offer unique adventures. Some allow you to hand-feed the fish yourself, while others throw bait from the boat, drawing plenty of marine life around you once you jump from the boat. In addition, check out nighttime snorkeling tours, which gives you a close-up view of the more sunlight-shy sea life. In general, outfitters require that you have experience for nighttime tours, so they’re better for individuals and couples traveling without kids. If you are an experienced snorkeler, it’s a great way to take a dramatic look at the reef under the moonlight, while guided by an experienced instructor. In the more remote, western section of the Catalina coastline sits Two Harbors, a village located on the strip of land between Isthmus Cove harbor and Cat Harbor. This is the second “major” village of the island behind Avalon, but don’t expect much hustle and bustle from a town that boasts only a hotel and restaurant or two, along with a general store and tiny school. The area does indeed have two small harbors, located on the isthmus’ northern and southern shores. The dive recreation center is located on the shore of Isthmus Cove, on the northern side of the isthmus, and most diving and snorkeling at Two Harbors is done there. The dive center rents snorkel equipment and offers tours — along with an impressive array of paddle board, kayak, beach umbrella and diving equipment rentals. Two Harbors’ relative seclusion and geographic protection make the water on this part of the island particularly clean. In fact, Scuba Diving Magazine honored Two Harbors as the “The World’s Healthiest Marine Environment,” with underwater visibility of up to 100 feet, as well as impressively large sections of kelp forests, along with abundant fish and invertebrate life. It also has larger stretches of sandy beaches than can be found in the more populated Avalon. These beaches make it possible to enter to start your snorkeling session by simply wading into the water, but kayak-snorkeling is also popular. In this configuration, offered either as part of a guided group or on your own, special dive-kayaks allow you to paddle out to the ideal location, then enter the water to snorkel. The Descanso Beach Club, located just west of Avalon, boasts a secluded beach which is open to the public. Here you can find snorkeling opportunities, as well as “snuba,” the popular combination of snorkeling and scuba which allows you greater water depth than snorkeling — but doesn’t require certification. Check out the sea lions, large schools of anchovies and mackerel that flourish in the little cove. Catalina Harbor, the other of the “two harbors” in Two Harbors, has a public dock and a small spit of land from which snorkelers and divers enter the water. Although you’ll need to carry in your own gear or rent it elsewhere, the area, known by locals as “Cat Harbor” is the most protected cove off Catalina. Other great snorkeling is to be had along the many little coves and tiny beaches of Catalina’s coastline, of course, but you’ll either need to access a public beach by traversing private land, or by boat. If you can manage, some of the prettiest spots for snorkeling include Gallagher Beach, Emerald Bay, Moonstone Cove and White’s Landing. Even though there are plenty of outfitters and clubs that will be happy to arrange snorkeling equipment, transportation and guided tours for you, knowing a little about how the island operates is helpful as you’re planning your Catalina snorkeling adventure. There are a handful of hotels and campgrounds on the island, but a snorkeling outing can also be experienced as a day trip. To get to the island, ferries from several points off the California coastline are available, as are airplane rides. No cars are allowed on Catalina without permit, however, so be prepared to take a car service or rent a golf cart once you arrive.